So, a little while ago I posted about a rather rubbish school morning we had. Well, I didn’t get around to saying that the evening before I’d planned to try a new system but was too tired to do the prep. Needless to say that evening, despite tiredness, I felt suitably motivated to get my act together and do the prep. So I wrote this poster. This is stuck to our bathroom door. It’s my latest attempt to help with mornings and its the best so far. It’s not 100% successful, what is, but it is definitely an improvement. What it is is a list of jobs (on the left, in black) that need to be done on a school morning. This in itself is not new, I have previously tried a tick sheet of jobs for them to cross off as they complete them. The new bit is the traffic light columns relating to what time the job is finished by. 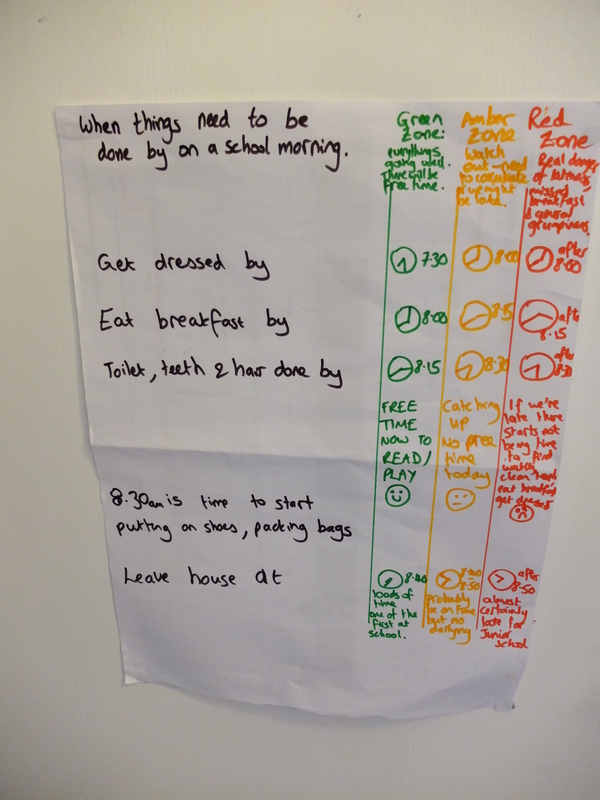 The aim is to be in green, when we’ll be ready in plenty of time and there’ll be time left over for playing before school. Red means we’re probably going to be late, grumpy and not have time to “just go and get my/do” at the last minute. And in between, there’s amber, a sort of, we won’t be late as long as we concentrate on the task in hand but there’s unlikely to be playing time. There is no associated reward sheet. This is just a framework, a reference point. And it’s helping them understand what the consequence of not getting dressed now means in an hours time. Because clearly, me saying “we’re going to be late for school” an hour before we have to leave was either too abstract or just not believable. But also, this is a fluid system. You can move between states. You can be in red and work your way back to amber by getting on with things, or into green. There is room to turn things around. And to let things slip. They refer to this, talk about zones. It really is helping them understand. And helping me to explain to them, for example “you have 10 minutes of the amber zone left to get dressed, if you’re not dressed by then then we’ll be in the red zone”. However, it still doesn’t prevent the unexpected last minute stresses. I have had him ready in advance only to fall down at the last moment at the leaving the house hurdle because something (I can’t remember what, his coat hurt maybe?) is suddenly and irredeemably wrong and nothing I do or say will help. I’ve been meaning to post this for a while. Because often, this blog is where I write out all the negative stuff in my life. It’s not that what I say isn’t true or is exaggerated, but it isn’t the whole picture. It’s my dumping ground for my failings and struggles and frustrations. And I thought it was important to acknowledge that sometimes I get stuff right. I’m not completely crap. I can do stuff. I can have good ideas (this wasn’t from a book or a website, it was my own plan. Based partly on my experience of what works and partly on approaches I’ve read – the aim was to give him the tools to understand what he needs to do so he can take responsibility for himself). So, I am sharing this primarily as a self esteem exercise for me. But also, I would be very happy if this idea, or an adaptation of it, or something else inspired by this approach, helped someone else. Because I wouldn’t one less tantrumy morning (or indeed any other time of day) in the world can only be a good thing! And while I’m at it, this is as good a place as any to make a note of an interesting resource I stumbled across recently for fidgety children – which he sometimes is. I have yet to try any. So, do you have any triumphs, parenting or otherwise, to acknowledge?